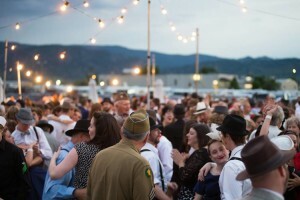 Always a lovely evening at the 1940s WWII Ball in Boulder, CO. Here are some amazing photos of the evening from Slackjaw Photography. They provided our background photo for the website. Thanks for the great shots! The Hot Tomatoes play all kinds of events, including corporate events, private events, public concerts, weddings, birthdays and much more!